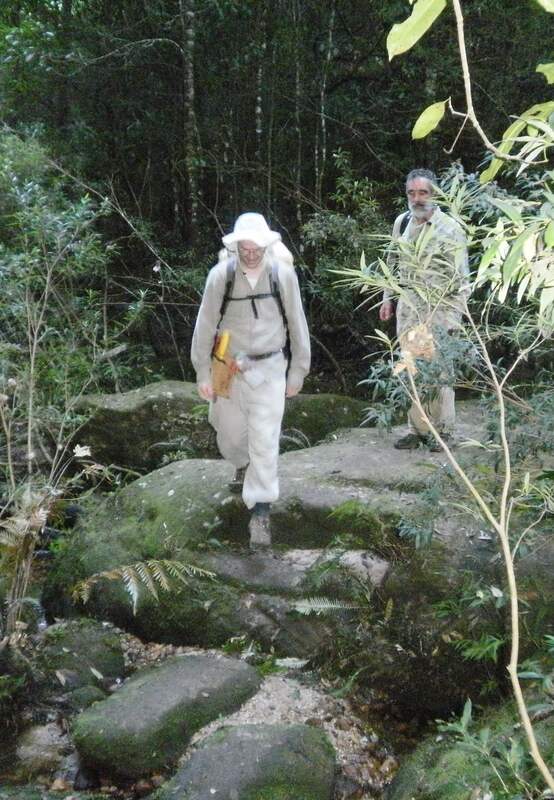 In June, I enjoyed another day in the bush in Sassafras Gully with other bushcarers. The day started around 9 am at the end of Yondell Street, Springwood where the team met each other: Chris, Roland, John, Rory, Karleen, Nelda, John, Michael, Bronwyn and Lyndal. Lyndal, our Bushcare Officer, checked that everyone had the necessary equipment for the day. Extra equipment was handed out to put in backpacks; making sure the morning tea was not forgotten. When everything was ready, the nine team members walked down Wiggins track until we saw the sign at the bottom of the gully. We found a clearing in the bush where we could put down our backpacks. From there we scattered further up the track and in to the bush to attack the weeds. There was a lot of Ginger lily and Lantana growing. There was also Mistflower, Wild passionfruit, Small leaf privet and Crofton weed. The day catered for all levels of fitness: the strenuous can climb the steep slopes but for the more gentle workers: they can stay near the track. The best part of the day was mixing with friends and making new ones. The morning tea was very yummy, relaxing for a while, and then it is back to work. It was soon lunch time, catching up with the latest bushcare news, then it is back to the weeds again. With so many friends the weeds were soon done and it was time to pack up, walk up the Wiggins track and arrive back at the cars at 4: 00 p.m. It was a very worthwhile day, relaxing with friends and doing the community a big favour, restoring the bush to its glorious state. If this sounds like you, why not join the next remote Bushcare group – contact Lyndal on lsullivan@bmcc.nsw.gov.au or ring the Bushcare Office: 4780 5623. This entry was posted in General on 28 July, 2015 by Bushcare Office.